Slomczynski, Kazimierz M. and Irina Tomescu-Dubrow. 2013. 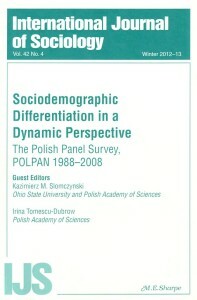 “Guest Editors’ Introduction: The Polish Panel Survey, POLPAN 1988-2008.” International Journal of Sociology 42(4):3-7. Karpiński, Zbigniew. 2013. “Heterogeneity, Consolidation, and Intergroup Relations: Tests of Blau’s Hypotheses.” International Journal of Sociology 42(4):8-32. Grygiel, Paweł and Grzegorz Humenny. 2013. „Longitudinal Investigation of Religiosity Trajectories: A Latent Class Growth Analysis.” International Journal of Sociology 42(4):33-55. Slomczynski, Kazimierz M., Irina Tomescu-Dubrow, and Zbigniew Sawiński. 2013. „Modeling Occupational Careers for a Turbulent Economy: From Simple to Complex Approaches.” International Journal of Sociology 42(4):56-70. Mikucka, Małgorzata. 2013. “The Transition to Insecurity: Employment Dynamics and Its Sociodemographic Differentiation.” International Journal of Sociology 42(4):71-99. Kunovich, Robert M. 2013. “Perceived Unemployment: The Sources and Consequences of Misperception.” International Journal of Sociology 42(4):100-23.